Project GRAD’s K-8 College/Career Awareness Coaches had much to be thankful for during November. 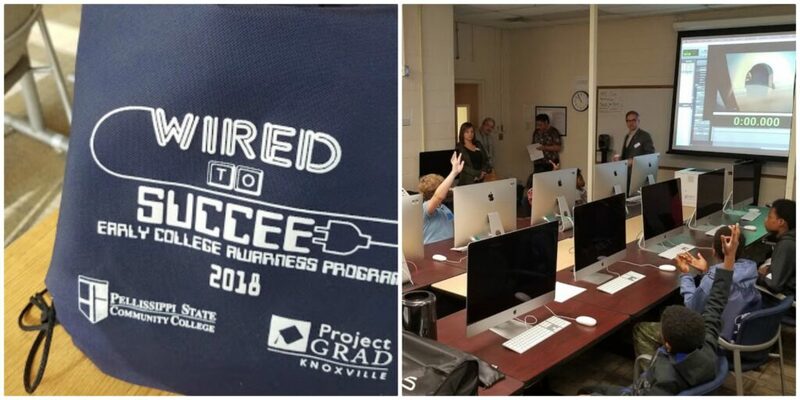 They enjoyed friends, family, turkey and the Early College Awareness Program (ECAP) at Pellissippi State Community College on Saturday, November 3rd. Pellissippi State and Project GRAD hosted families on Pellissippi’s Magnolia Avenue campus to learn about the benefits of attending classes at one of Tennessee’s premier, two-year institutions. Families also explored careers in nursing, audio-visual production and coding. In the nursing sessions, the group took vital signs from robots. In audio-visual production, students recorded voice-overs on cartoons. Finally, families worked on creating their own video game in the Computer Lab. ECAP Pellissippi State 2018 was amazing!